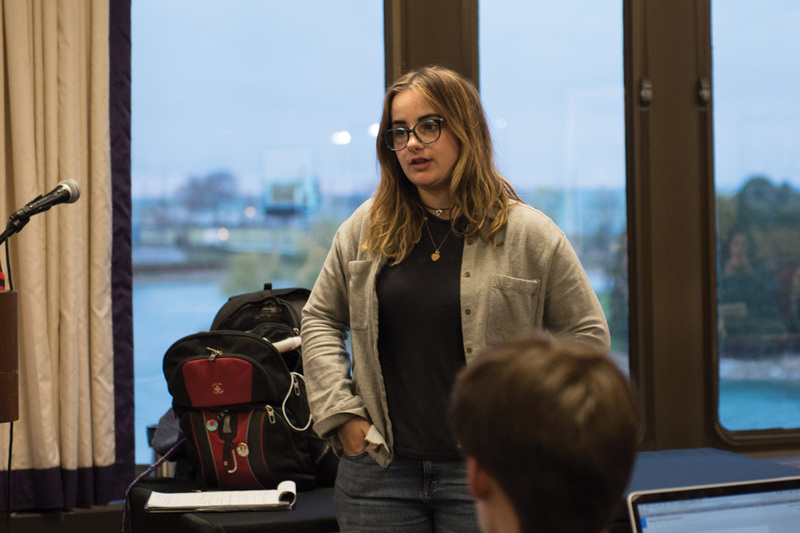 Medill junior Isabel Schwartz speaks during Wednesday’s Associated Student Government Senate. Schwartz introduced a resolution regarding students’ wellbeing at Senate. Associated Student Government Senate discussed a resolution Wednesday that would urge the University to create a wellness advisory board and a mental health training program for faculty. The resolution, introduced by Medill junior Isabel Schwartz, will be voted on next week. If passed, it will be presented to Faculty Senate at its meeting on May 3. The resolution calls on University administrators to create a wellness advisory board comprised of students, faculty and staff. The resolution also supports the creation of a mental health training program for faculty and staff that would help them identify and assist students in distress. The resolution also describes similar programs at other universities, like the Wellness Advisory Board at the University of Chicago. The 2013-14 annual Counseling and Psychological Services study said 23.3 percent of students reported seriously considering suicide. Schwartz created a “wellness chair” position for 50 different student groups in March 2016 to increase their commitments to students’ mental health. She said the ASG resolution is an important step toward student wellness at NU. The resolution was sponsored by ASG President Nehaarika Mulukutla and executive vice president Rosalie Gambrah. It was the first resolution they have sponsored in their new roles after they were sworn in at last week’s Senate. Mental health was one of Mulukutla and Gambrah’s three main campaign goals. During the campaign, the Weinberg juniors emphasized the need to increase funding for student groups like NU Listens and NU Active Minds. Mulukutla told The Daily the resolution would help faculty and staff understand the role they play in students’ wellbeing. “A lot of (campus culture) also has to do with the fact that faculty and staff are an active and real part of the deadlines, the initiatives, the actions and even sometimes the problems students face, but also the solutions to those problems students face,” she said. Schwartz said this resolution would help campus resources like CAPS, Health Promotion and Wellness and others work together to address students’ mental health. Later in the meeting, Senate also elected four senators to the Rules Committee. Vice president for A-status finances Daniel Wu, a Weinberg junior, presented emergency legislation to change the A-status code, which passed at the end of Senate. Weinberg junior Lars Benson presented legislation changing the newly-created position of vice president for housing, dining, and facilities to vice president for campus life. The position was created along with vice president for health and wellness when vice president for student life was divided into two positions.